In total silence I am flying above Merano. The only thing I hear is the wind whizzing softly through the lines of the screen. I have miles of view over the landscape. In the distance is Bolzano, between small villages that seem to be scattered randomly across the landscape. At times I can see the peaks of the Dolomites behind the clouds. 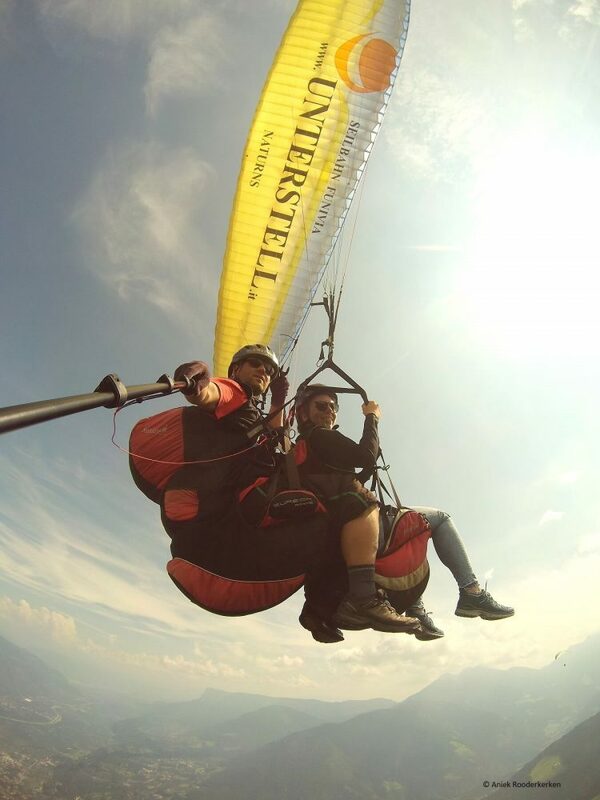 Paragliding in South Tyrol is an unforgettable experience! “Are you ready? I count from 3 and at 1 you start running.” Peter explains. Only a few seconds later, I am running as fast as I can to the edge of the mountain. I feel no more ground under my feet and then we flying. A gust of wind draws on the screen and we are lifted up high in the air. I really am flying through the air, I realize! I look around and enjoy the view. Far below me I see a hotel with a bright blue pool. A couple lying on a lounger suddenly gets up. The boy points upwards, at us. “Wow, that’s what I want to do”, you can almost hear him say. The houses and trees beneath us are getting smaller and we are slowly floating in the direction of the Parco Naturale Gruppo del Tessa. Tomorrow I will start hiking the Alta Via di Merano, or the Meraner Höhenweg. High in the air the distances that I am going to hike look impressive. Same with the mountains that I am going to climb. Mutch too soon the flight is already over. We navigate in the direction of the landing area and within a few seconds I am standing with both feet on the ground again. While Peter folds the screen, after landing, I see how my boyfriend also lands on the ground. I look up again at the sky where I flew just moments before. I want to go again! The mountain stations in South Tyrol are the perfect starting point for paragliding. 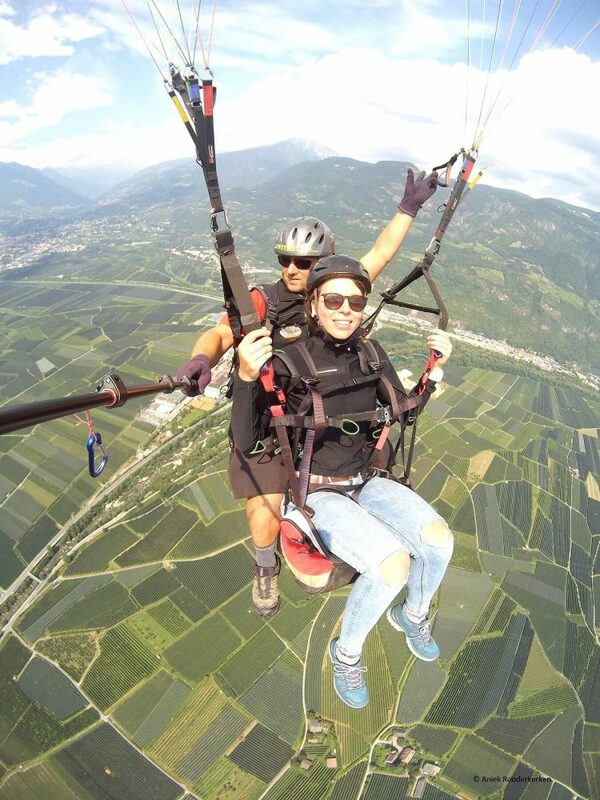 I made a tandem flight from Lana, near the Parco Naturale Gruppo del Tessa and the Alpi Venoste or Ötztal Alps. With a view of Merano, Bolzano and the rock formations of the Dolomites, you have a unique view of South Tyrol! I booked the tandem flight via Tandemflüge FLY 42 in St. Martin. 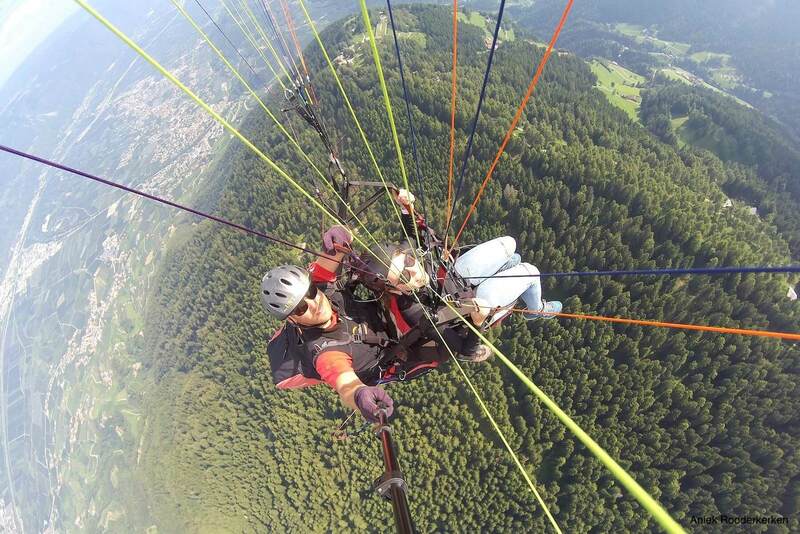 Paragliding is possible from 80 euros per person, including ticket for the cable car.